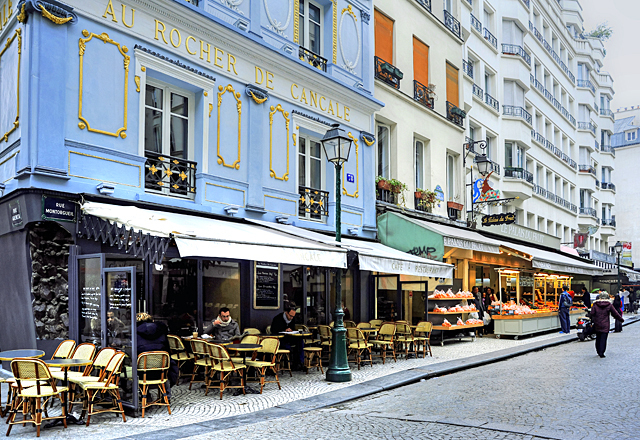 A charming pedestrian cobbled street in the heart of Paris, rue Montorgueil, is lined with wonderful restaurants, cafés, cheese shops, bakeries, wine shops as well as Paris’ oldest (and one of its finest) pâtisseries. 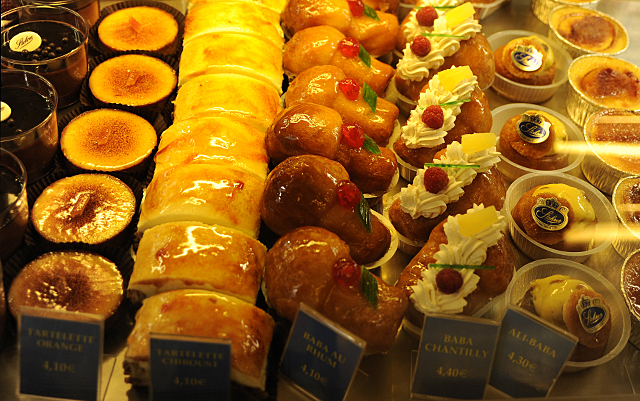 It’s a real joy to explore, especially for food lovers. Here are just some of the street’s culinary highlights. Rue Montorgueil’s name literally translates as “Mount Pride” after the hilly area on which the street lies. Look out for the only fortified tower in Paris, Jean-Sans-Peur, a Medieval tower built in the early 15th century by by “Fearless Jean”, the infamous Duke of Burgundy, who assassinated his cousin, the Duke of Orléans. For a small entrance fee you can climb the staircase and visit some of the original rooms. However, the street is most known as a market street that only tourists in the know visit. True to its name, this restaurant offers a wide range of variations on this French classic, snails with parsley and garlic butter, with equally delicious main meals and desserts, served at a leisurely pace in a traditional setting. Opened in 1730, Stohrer is famous for creating the delectable Baba au rhum (pictured below), named after Ali Baba from ‘One Thousand and One Nights’ by King Stanislas of Poland. The range of beautiful pastries, cakes, savory tarts and chocolates will have your eyes popping and your taste buds dancing in anticipation. 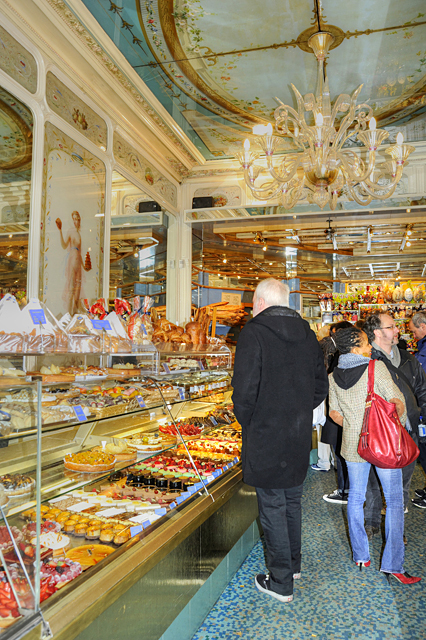 The shop interior, which dates back to 1864, is as beautiful as the cakes are delicious. Unlike many other fishmongers I can think of, the smell of fish here is subtle, a sure sign of the fishes freshness. Everything here is also displayed so beautifully that you know that Soguisa doesn’t just sell fish – they enjoy selling fabulous fish! 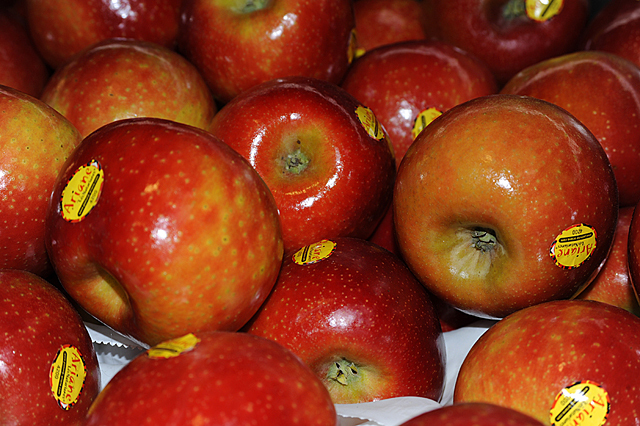 The freshest fruit and vegetables you’ll find anywhere plus some excellent dried fruit and nut mixes. It’s the perfect place to shop for picnics or a healthy snack. 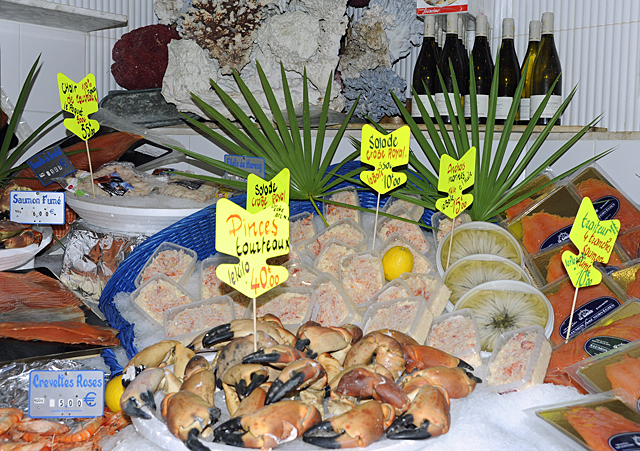 A typical atmospheric French bistro, famous for selling oysters, Au Rocher de Cancale sells good, moderately priced food. It’s the perfect place for a leisurely lunch and a spot of people watching or an elegant evening meal. Reservations are highly recommended as it’s a popular spot with locals. 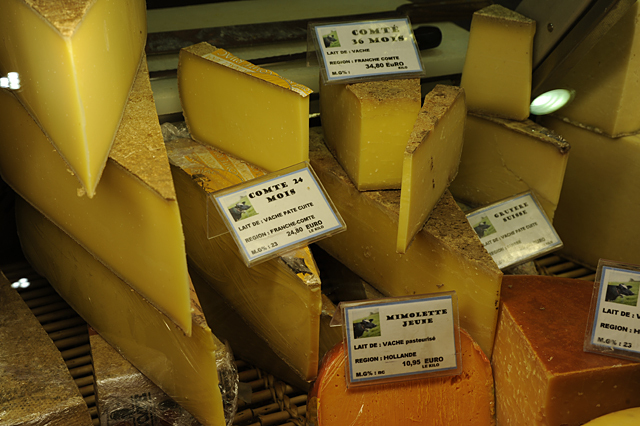 One of the best fromageries in Paris, a visit to La Fermette at number 86 rue Montorguei is a must. 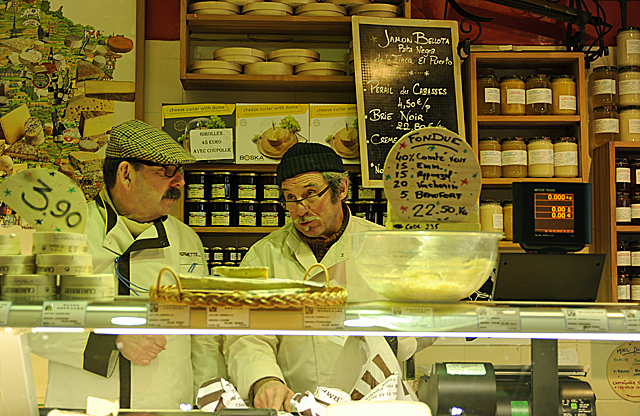 They sell a huge collection of French cheeses as well as the some of the best that England, Italy and Holland have to offer. The owners and staff (pictured top) are extremely helpful and fun. It’s not unkown, for instance, on a hot day for them all to be wearing brightly coloured Hawian shirts – or so I’m told! 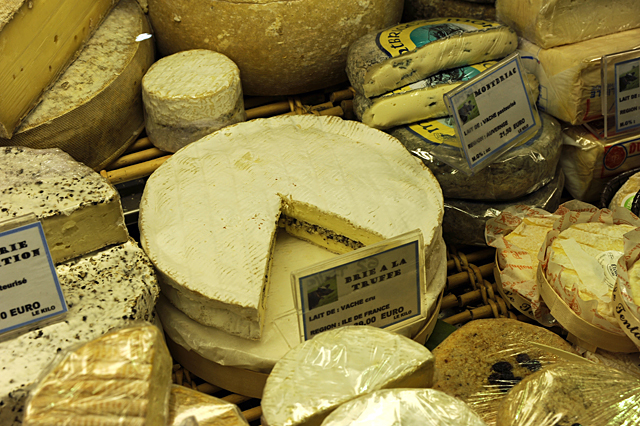 Don’t miss the aged Comté or the brie with truffle. So good! This article is now available to download for free on GPSmyCity. It can also be upgraded to include an offline map and GPS guided travel routes. Follow this link on your mobile or android device to find out more, Walking Tours in Paris. Thank you! Hope you enjoyed your breakfast!